The parish of Babingley lies in western Norfolk about 3 miles north of the port of King's Lynn and adjacent to the main A149 which links King's Lynn to Hunstanton and the north coast of the county. Babingley is a very small parish bordering the Royal estates of Sandringham and has no village as such merely a scatter of farms. The parish stands on the first dry ground east of the marshes which border The Wash and has poor soils and much heathland. The original St Felix is in ruins and stands forlorn in a field above the Babingley River. 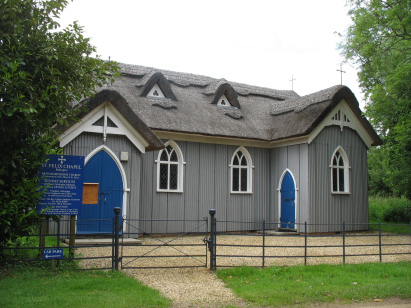 The present church was built at the behest of the Victorian Prince of Wales and is rendered in cast iron and thatch. 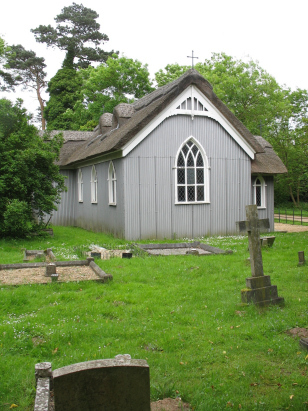 It is a small edifice as befits this tiny parish. Intriguingly Babingley, allegedly, is where St Felix first came ashore to bring Christianity to East Anglia and thus has a tradition back to the 7th century, it is not too difficult to picture a monk's cell decorating these Norfolk heaths with their twisted pines and views over the marshes to the mud-flats of the Wash.
As you would expect for such a small parish a single standard 800-entry register covers not only the period of the project but continued in use up into the late 20th century. This register is filmed on Microfilm MF1703 in the collection of the Norfolk Record Office which was used to prepare this short transcript. The film is one of the more recent in the collection and benefits from clear and contrasting images making for a very straightforward piece to prepare.